0 | 7 students enrolled. Certification in Online Interest Rate Derivatives course is jointly certified by NSE Academy & Elearnmarkets (NSE Academy is a subsidiary of National Stock Exchange of India). Interest rate derivatives are considered to be one of the most popularly traded products in the international derivatives market. Be it financial sector or housing sector, interest rate derivative products have earned significant importance as the primary instruments available for interest rate risk management. One should opt for this program to get an understanding about the money market as well as get a clear idea about how interest rate derivative products work as a risk management tool. 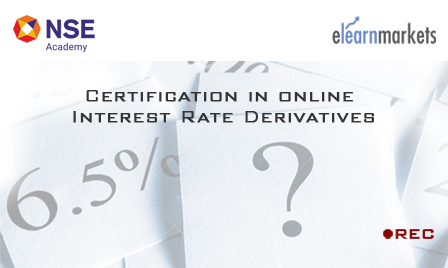 Certification in Online Interest Rate Derivatives Tutorial is a perfectly designed program . It aims at creating a better understanding of the role of interest rate derivatives in different types of trading strategies such as hedging, speculation and arbitrage. It discusses about the concepts underlying the money market as well as gives insights into the motives of and operations related to the trading of interest rate derivatives. This Interest Rate Derivatives Tutorial even focuses on pricing and risk management principles that are applicable in this market. Students enrolling for this programme will be given a “Certificate of Participation” from NSE Academy facilitated by Elearnmarkets.com, after successful completion of the course. Participants will also be given free access to related webinars conducted by Kredent Academy for further knowledge enhancement. An email query support, Question & Answer community platform can also be availed by the student for any kind of doubt clearance related to content while pursuing the course.